Scholars Townhouse Hotel was built in 1867. It was used as a Christian Brothers residence and has been tastefully renovated in a modern style. The building has retained its historic charm with stained glass windows and high coved ceilings while offering all the facilities and features of modern accommodation. Located in the center of the historic town of Drogheda in Co.Louth, the hotel is only 20 minutes from Dublin airport via the nearby M1 motorway. Local tourist attractions vary from an array of links golf courses to famous historic sites such as Newgrange, the Hill of Tara, Slane Castle and the famous Battle of the Boyne site. Scholars Restaurant is a unique wonderful experience offering fine dining with silver service. 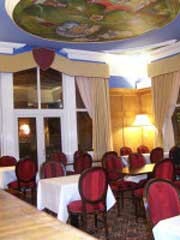 Our restaurant has been decorated to the highest standards offering a unique depiction of the history of the locality through the hand painted frescoes that adorn the ceilings along with the plasterwork on the walls depicting the famous Battle of the Boyne.